This is a lingual nerve during wisdom tooth extraction injury case filed on behalf of a woman in Hagerstown. This dental malpractice case was filed in Health Claims Arbitration on February 10, 2016. It is the 61st medical malpractice case in Maryland in 2016. A female is a patient at Robinwood Dental Center for two years in Washington County. They tell her that she should have her four wisdom teeth extracted, even though only one of them seem to be slightly problematic. During the extraction, no notes are taken as to the methods the doctors used. The only "notes" are those in the billing records that state they are surgical extractions. The doctor fails to take proper precautions and severely traumatizes the patient's left and right lingual nerve during the procedure. This causes the woman's mouth and tongue to be permanently numb and painful. The injury in this case was to the lingual nerve. This nerve is inside the gums and the soft tissue at the back of the mouth on the inside where the tooth is. The lingual nerve is most typically located very low near the floor of the mouth. But, and this is the tricky part, it can also be located in the gums. So this means this nerve is often be sitting right in the eye of the storm of where the dentist is working. So the dentist certainly needs to be careful. The defense in this case is easy to predict. A lingual nerve injury is a known and recognized complication of many dental procedures, including this one. But just because something is a known risk does not mean negligence can't cause it. Death is a known risk of driving on our highways but it is still negligence when some comes across the double yellow line and kills someone. This case is in Hagerstown. 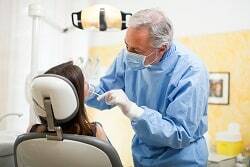 There are not many medical malpractice lawyers willing to handle a dental malpractice lawsuit in Washington County. How to put a price tag on medical malpractice cases in Maryland?